Her shoulder squeezed the barbwire gait closed on the canyon. She stepped onto the worn Ford bumper with the ease of a 13-year-old and took her corner seat on the rim of the driver’s side tailgate. 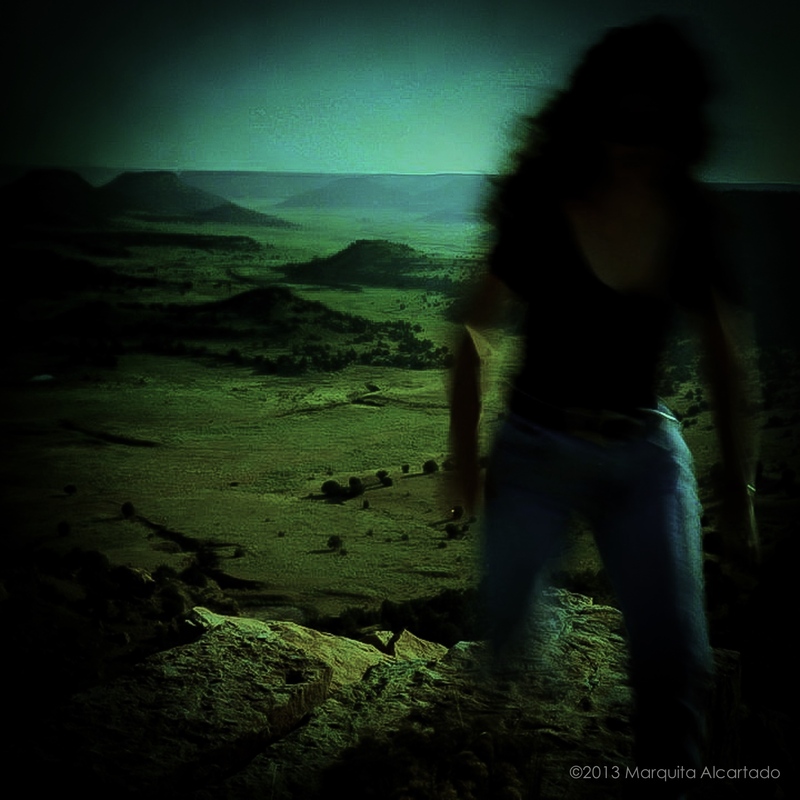 Her head buzzed with the shrill of those psychedelic New Mexico grasshoppers. She watched her reflection in the rear window as the landscape of her New Mexico life whirled around her image swaying with the motion of the sunflowers. Who will I be? I co-owned a photographic retail store in East Sacramento for 11 ½ years with my artist-cousin and fellow photographer, Ginny Giles. Our business had the distinction of being one of ten, women-owned specialty photographic retail operations in the U.S. How I came to own that store and my journey from that early tailgate moment of awareness was not by design, as in most life experiences– my path evolved. Camera/Arts was the community center for artists, students and all genres of expert photographers. An early morning phone call from the alarm company on Dec. 31, 2007 alerted Ginny and I to our final burglary event. We soon found ourselves wandering around the broken glass, and debris from the catastrophic end of our dream business, although we were not fully aware of the consequences, in our frenzy to clean up the mess and file our lengthy crime report. My gut told me this was not an event, in the current economic climate, that we would survive intact. I kept saying over and over to myself, “this is big”—meaning this is too big for us to recover and maintain our tenuous hold on our market. It was a nauseating truth that I could not articulate. Six weeks later we terminated our loyal staff of six employees who, were like family to us. They had all attended my wedding just three months prior to this morning when we had to inform them of their new unemployed status with one week’s notice. To their credit, they came to work every day of that final week and held Ginny and I together in our despair. Five months following those difficult days, we abruptly closed our doors. Speaking for myself, this was the beginning of a painful cathartic shift. The loss of the store and its special place in the hearts of so many lovely people filled me with confusion, fear, doubt and a sense of failure. The relationships we had were not lost but there was no longer a “place” for them to inhabit. The place was a shell filled with echoes and dust—hollow and devoid of images on the walls. It looked how I felt. Immediately following the events of closing and for the next 15 months I experienced some disturbing physical and emotional symptoms–clinical depression, losing my hair in clumps, weight gain, bloating, blinding headaches, phone phobia, insomnia, agoraphobia, just to name a few. The worst of these for me, was some transitory aphasia. The aphasia was subtle in the beginning. I was confused by my failure to remember the name of a good friend or simple words, like and or the, for linking my thoughts and phrases, for instance. It even happened with close family names—the names of my sisters or even being able to access the word “Mom” at times. I felt so stupid. The words and the emotions were in separate places in my mind. The aphasia was always there, sometimes worse, and in those times I was very quiet or simply spoke between long pauses and frequently stuttered, uncharacteristically. I did not disclose this to anyone, including my dear supportive husband who would have insisted on a trip to a doctor regardless of my uninsured status. In the back of my mind I feared I might be experiencing the effects of a mild stroke. Well, nobody could change that either so I ignored this nagging hypochondria. I am a photographer, not a brain surgeon. I believe the language area of my brain is full of symbols, colors and pictures. These are the elements of my hieroglyphic code for life experiences. I Googled the aphasia problem trying to find some herbal solution but assuming, that the symptom was psychological or emotional, time was the only healer. It was around this time in my awareness of the problem that I received a FaceBook invitation from someone. I did not even know what FaceBook was—perhaps just another word to confound me. Reluctantly, I followed the directions and joined with the intention of deleting my account in a few days. I would check my email in the morning and find 15 or so messages from my FB account indicating the activity that had gone on since my last login status. The FB salon for me is very much like the stream of consciousness conversation that used to happen in the store when long-lost friends popped in out of nowhere or with our eclectic group of regular customers who visited on a weekly basis. On FaceBook there were conversations on the darndest things (vegan cookie recipes, the diminishing value of broadcast journalism as a national resource, live regional music reviews, comments on YouTube videos of stupid cat tricks, Glenn Beck weeping, etc.). So many wonderful supportive friends were there to acknowledge and offer encouragement to me when I posted my going-back-to-school intentions and my part-time teaching job at a local community college. When my husband and I adopted a black lab puppy last summer, I eagerly created a picture album of snapshots of little Bear and so many animal lovers responded to those images. Bear was our first puppy as newlyweds and so in effect he was our little baby Bear with whom we spent a tremendous amount of cuddling and bonding. Five weeks later, when Bear was hospitalized with parvovirus, I posted updates on his condition to my FB friends and then later I posted those words, “RIP our precious baby Bear. He was a good boy.” So many sympathetic and comforting thoughts reached out to us. It was a completely unexpected loss that seemed to compound with the other layers of loss that had disrupted my delicate sense of equilibrium—my language center was completely discombobulated. I could not speak to anyone, except for a few words to my husband, for a long time. I kept my interaction with others to a very small circle. It was this loss that triggered me to start creating small worlds within the confines of the 420-character limit Facebook status post. It was a way for me to exercise my mind and maybe it would help me find those words that were missing from the chalkboard in my brain, scattered willy-nilly in my subconscious mind. It was something I could do without speaking–to link the emotion to the image, then connect it to the word and pull it out from where it was hidden and internalized. I called them images, the memory fragments, sometimes describing them in one long sentence and, to save on the character count, I would eliminate the double spacing after a period and replace the and with an ampersand– just so I could keep an important word. I closed my eyes and whatever memory image I could see, I would describe and then edit. It took me about 15 or 20 minutes to condense the language so that it would fit within the restricted space. FaceBook’s arbitrary character editor was the equivalent of sitting in front of a really good therapist, who asks a few good questions. Is that what you want? Do you know why you said that just now? Our time is up, so save that thought for our next session. This image originates from a moment during my mother’s exodus from her marriage to my father when she gathered her four children and escaped, driving through the worst blizzard on record on the way to her childhood home in New Mexico—my grandmother’s ranch. It came to me in one thought, following a long moment of studying my dry cracked hands, which are identical twins to my Mother’s hands. That image of my mother driving through one of those 100 year blizzards, hands on the wheel so assured, her posture erect, perfect red lips closed, eyes focused and unblinking and every now and then her right arm on a hair-trigger extends like an automatic guard rail in front of us. Mother, in this moment, epitomizes my idea of the goddess protector and storm guide. My hands are the index to this image thumbnail. I identified with the personal transformation that was required for my mother to survive that experience and I envied her fearless resolve in the face of a blinding snowstorm. The bleakness behind her was more frightening that her future at that point. This image of my mother came to me after I was reviewing some old contact sheets of black and white negatives. It was the first time I realized how a sense of place is so elemental to my photographs of my mother. At the time of my departure from New Mexico, my grandmother and I were the only ones living on the ranch. I knew intuitively that on my return, this place would never be the same. The canyon walls enveloped her formidable form in my perspective, absorbing her while also managing to convey a sense of protection to her inevitable fragility in their shadows. I know if she were alive today, my grandmother, would be the first to tell me to stop wallowing and that I am not a failure. Those are not words that I can provide evidence for but I feel this and know it to be true. I clipped her fingernails the night before I left. Her hands were too arthritic to do this or see doing it very well. I combed her hair, sweeping it up & over the back of her head & pushing it up into to her unique puffs and waves. Morning is blue tears, dust & her image looking at mine in the rearview mirror for tears & one last glimpse of this receding desert tide of change. She bends finally, reaching for her yard broom. Grandma is always in my rear view mirror. Finally the exercises have led to words and memories that I have never expressed—observations on the incredible natural world–some of which I have seen firsthand. I discovered the “migration of the baby cherry toads” after standing in a dry dirt pond and curiously turning over a huge slate-like clod. Literally hundreds of baby red dotted toads came hopping out of their damp dirty home. They were happy to see me I thought. I picked up one of the little Mr.’s and told him about the cherry agate covered hills of Peacock Canyon. One day you will be a beautiful stone. The most recent status post describes my little sister and our unique bond as playmates. Its imagery symbolizes my readiness to start using my language muscle a bit beyond the boundary of this exercise. The resident grief, fear and confusion are being replaced with other more hopeful images. She dreamed of her sister. They played house among the wind break of Elms on the south side of Grandma’s home. One busied her self with creating imaginary walls and rooms and the other perfected her ability to swing from one high branch to another against the eternal turquoise sky. That turquoise sky is an image we all possess in our personal landscape vernacular and our experience with this sky is intimate and familiar. It does not require description. It was this particular sky that was there when I photographed my mother kneeling on that hallowed ground in the shade of the peach tree and on the morning when I said goodbye to my grandmother and drove away so hesitantly, watching her in my rearview mirror. The practice of swinging from branch to branch is a fearless exercise that requires some sense of play. It is this quality that best describes the creative process for me– finding the most suitable conduit for expressing an emotion or experience. It is a process that provides for the language of play against the backdrop of a limitless sky but more important still, is its capacity for linking the images of healing to a breathless moment when one hand lets go so that the lead hand can reach farther and for a split second one is flying between hand holds in weightless exhilaration. Posted in Essays, PhotographyTagged Creative writing, economic loss, FaceBook, life transitions, Loss, Photography, Poetry, relationships, Resilience, transformation, WritingBookmark the permalink. Thanks for the feedback:) I’m working on some new content and editing.